Product prices and availability are accurate as of 2019-04-23 23:08:24 UTC and are subject to change. Any price and availability information displayed on http://www.amazon.com/ at the time of purchase will apply to the purchase of this product. 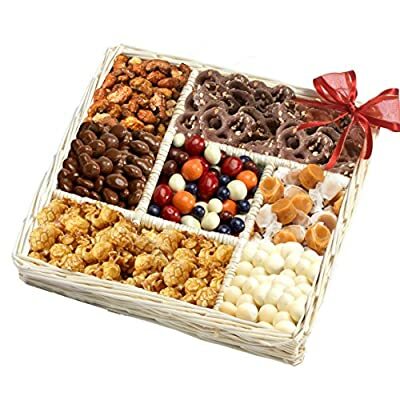 The perfect snack gift with an abundance of soft caramels, mixed toffee nuts, gourmet popcorn, salted caramel pretzel twists, hickory smoked almonds, butter peanut crunch, & assorted milk toffees, they'll go nuts over this distinctive gift. Great gift for birthday, thinking of you, or any occasion Perfect gift basket for family and friends, or as a corporate office gift. Gift tray includes: Gourmet Caramel Popcorn (3oz), Mixed Toffee Nuts (3oz), Chocolate Covered Almonds (4oz), Soft Vanilla Caramels (approx. 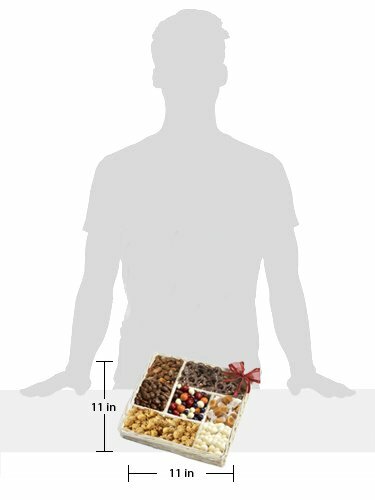 14pc), Chocolate Covered Assorts Fruit (4oz), Yogurt Covered Almonds (4oz), Chocolate Enrobed Pretzels Topped with Butter Toffee (5oz) GIFT TRAY DIMENSIONS: 11" x 11"x 2" high Kosher Certified OK D. Giving a kosher gift ensures that all recipients can enjoy and partake in your gift.